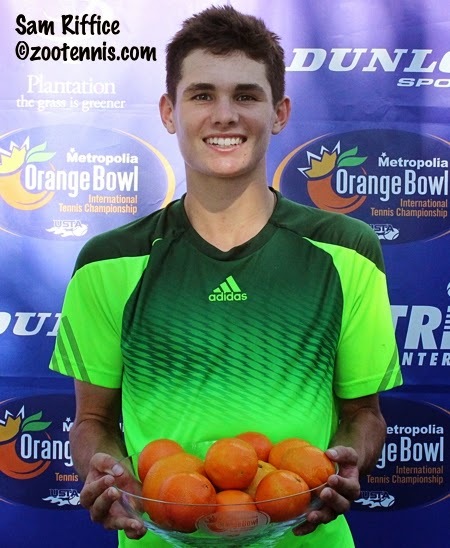 Although I still have my December Aces column for next week, this Junior Orange Bowl recap for the Tennis Recruiting Network concludes my onsite tournament coverage for 2014. It's been quite a year in junior tennis, and I'm looking forward to an even better one in 2015. As with the Eddie Herr and Orange Bowl, I will post the videos of the finalists next month, but all four champions can be viewed below. The quarterfinals are set for the USTA Winter Nationals, with both No. 1 seeds in the Girls 18s and G16s falling in fourth round play today in Scottsdale. No. 10 seed Mia Horvit, who you will notice in the list below is a wild card recipient, defeated top 18s seed Jessie Aney 7-5, 7-5 and will meet No. 5 seed Sara Daavettila in Wednesday's quarterfinals. No. 4 seed Star Makarome plays No. 12 seed Emma Higuchi, No. 6 seed Rebecca Weissmann, another wild card, plays No. 11 seed Gabby Pollner and the only unseeded player remaining in the G18s, Elizabeth Profit, faces No. 2 seed Kelly Chen. Top girls 16 seed Grace Joyce was beaten today by No. 9 seed Alyvia Jones, who will play No. 15 seed Elysia Bolton in the quarterfinals. No. 4 seed Chiara Lommer faces Victoria Emma, a No. 17 seed, in the other quarterfinal in the top half. In the bottom half, No. 6 seed Samantha Martinelli plays unseeded Nicole Mossmer and No. 8 seed Carson Branstine takes on No. 2 seed Morgan Coppoc. Both No. 1 seeds in the boys 16s and 18s have reached the quarterfinals. 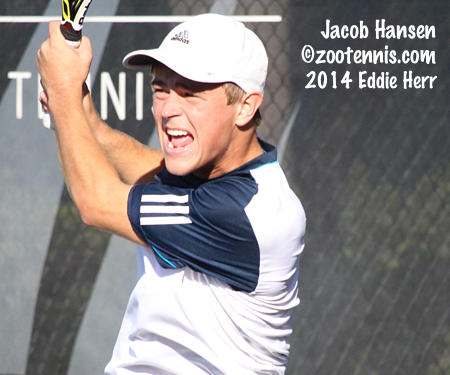 Boys 18s top seed Jacob Hansen, a wild card, will play No. 8 seed William Genesen with No. 3 seed Eric Rutledge taking on Andrew Heller, a No. 17 seed. No. 6 seed Korey Lovett plays No. 11 seed Zeke Clark in the bottom half, with No. 7 seed Gianni Ross facing the only unseeded 18s player remaining Alafia Ayeni. Top boys 16s seed Jacob Brumm, who has lost only eight games in his first four wins, takes on No. 13 seed Joshua Marchalik in the quarterfinals, while No. 3 seed Jake Van Emburgh faces No. 15 seed Noah Makarome. In the bottom half, No. 4 seed Timothy Sah plays Austen Huang, a 17 seed, and No. 5 seed Jason Liu goes up against No. 2 seed JJ Wolf, who has lost only nine games in his first four matches. Complete results in the 16s and 18s, including for doubles, which are into the semifinals, can be found at the TennisLink site. In the 12s, played in Tucson, No. 1 seeds Aidan Mayo and Gabriella Price have reached the quarterfinals, as have top 14s seeds Marlee Zein and Brandon Nakashima. Draws are available at the TennisLink site. As referenced above, I received the list of wild cards granted for the tournament today and am including it below. This week is pretty quiet in the tennis world, even for the juniors. In years past, the Grade A Casablanca Cup was going on in Mexico City, but the ITF moved that tournament to before the Yucatan, Eddie Herr and Orange Bowl tournaments, so this really does amount to an off-season on the ITF junior calendar, with only two Grade 4s, one in Sweden and one in China, this week. The ITF Pro Circuit calendar is even more sparse, with just one women's $10,000 tournament scheduled in Hong Kong. 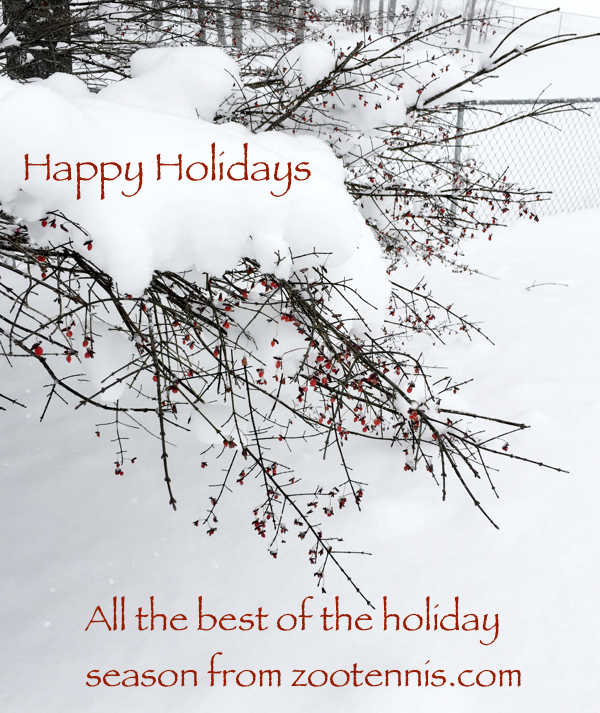 While I was in Florida covering the Eddie Herr, Orange Bowl and Junior Orange Bowl, I obviously missed many articles I would usually link to, so in the next several days, I will be trying to catch up on what I've missed and pass on links. The ITF announced its year-end champions, with Russia's Andrey Rublev and CiCi Bellis of the US winning those coveted titles. They will be honored at the ITF's ceremony in Paris during the French Open. 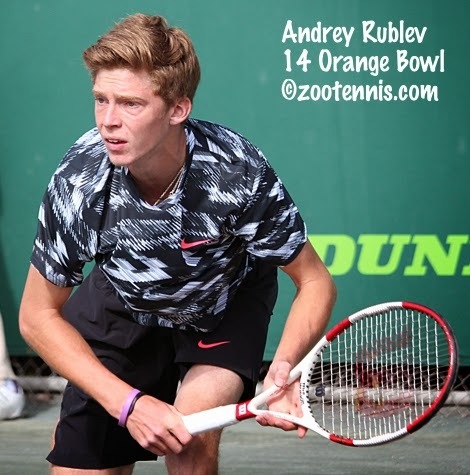 Rublev went straight to the Dominican Republic after losing in the semifinals of the Orange Bowl and won the singles title at the $15,000 ITF Futures tournament there, beating Mitchell Krueger of the US in the final. Krueger and Sekou Bangoura(Florida) won the doubles championship. The USTA has published its Year in Review series, with a look at Bellis' great year and the Wimbledon success of Rubin and Kozlov and a separate article on the US sweep of the Junior Fed Cup and Junior Davis Cup. Florida freshman Brooke Austin is the subject of this feature by the Independent Alligator. (Not sure what the reference to Florida's blue clay is about). The ATP's Josh Meiseles has written a two-part series on the rising Young Guns, with Nick Kyrgios of Australia, Dominic Thiem of Austria, Jiri Vesely of the Czech Republic and Borna Coric of Croatia featured in Part 1, and Alexander Zverev of Germany, Thanasi Kokkinakis of Australia, Yoshihito Nishioka of Japan, Hyeon Chung of Korea and Kyle Edmund of Great Britain featured in Part 2. 2010 World Junior Champion Daria Gavrilova, who is switching her national allegiance from Russia to Australia, won the Australian Open wild card playoff. Jordon Thompson won the men's wild card playoff for the second year in a row, defeating former Tennessee All-American JP Smith in the final. Roger Federer discusses his parenting philosophy in this BBC interview. Ben Rothenburg explores the ramifications of the recent ATP and ITF prize money increase announcements in this New York Times article. Jonathan Kelley has been busy on his On The Rise blog, not only keeping his weekly career-high rankings list for Americans current, but also wrapping up the (second half of the) year in US tennis. His look at the WTA women is here, and the ATP men is here. Both have extensive coverage of juniors included. 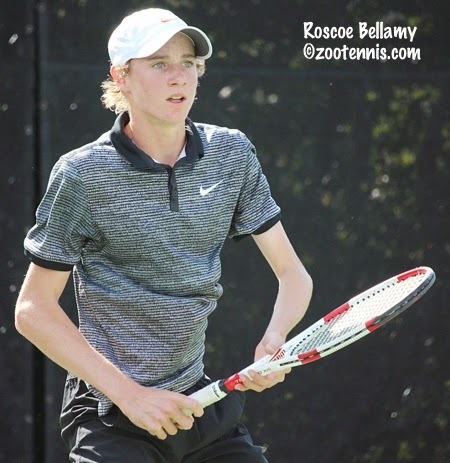 In her new tennis blog, Just Drop the Ball, Lang features 10 American boys and 10 American girls to watch in 2015, and has posted a question and answer session with 18-year-old Californian Deiton Baughman. After two rounds at the USTA Winter Nationals, all eight No. 1 seeds remain in the running for gold balls. B18s top seed Jacob Hansen needed a third set tiebreaker to advance to the third round, beating Adam Ambrozy 5-7, 6-1, 7-6(2), while Jessie Aney, the G18s top seed, also needed three sets to advance to the third round, beating Paris Corley 3-6, 6-4, 6-3. In Saturday's first round, B18s No. 2 seed Spencer Furman was ousted by Joseph Rotheram, and according to Universal Tennis Rating, that was a true upset, with Rotheram having a UTR rating of 11.68 to Furman's 13.06, well more than the 1.00 difference that they deem worthy of that word. B18s No. 5 seed Cameron Klinger lost in today's second round, to Nicholas Beaty, but with a difference in their UTRs of only .40, that is not considered an upset in their system of categorization. All top 8 seeds in the girls 18s have moved into the third round. In the B16s, two top 8 seeds lost, both in today's second round. Ben Goldberg beat No. 8 seed Caleb Chakravarthi 7-6(4), 6-2 and Paul Spencer defeat No. 7 seed Payton Holden 4-6, 6-3, 6-3. In both those instances, the difference in the opponents' UTR rankings is less than the 1.00 difference required for calling it an upset. The same is true of the only Top 8 seed to fall in the G16s, with No. 3 seed Isabelle Lorenzini losing to Nicole Mossmer 6-2, 6-3 in the first round Saturday. Jacob Brumm, the top seed in B16s, and Grace Joyce, the top seed in G16s, won their second round matches in straight sets. For whatever reason, the seeds held more to form in the 12s and 14s, with only one of the Top 8 seeds in any of the four divisions losing. No. 2 seed Billy Suarez lost to Dillon Blake 5-7, 6-4, 7-6(3) in today's second round. I saw Blake at the Junior Orange Bowl, where the Miami resident qualified in the 12s and reached the third round, losing to semifinalist Jeffrey von der Schulenburg of Switzerland, a No. 1 seed, 5-7, 6-2, 7-6(4). Although obviously raw and relatively new to the game, Blake impressed me with his size and power and is certainly one to watch. Top seeds Aidan Mayo(B12s), Gabriella Price(G12s), Brandon Nakashima(B14s) and Marlee Zein(G14s) all advanced to the third round with straight-set wins. Lisa Stone of Parenting Aces is out in Scottsdale for the 16s and 18s, where her son is competing, and although she isn't doing match coverage, check out her blog for more on her tournament experiences and those of her son. Unfortunately he had to retire from his second round match today with an injury, hopefully not a serious one. Complete draws and results from the 12s and 14s in Tucson are here. Complete draws and results from the 16s and 18s in Scottsdale are here. Sports Illustrated's Courtney Nguyen annualy asks tennis writers around the world what they are most looking forward to in the upcoming year, and I had no difficulty coming up with the one most important to me--the replacement for Patrick McEnroe as general manager of player development. While I was in Florida talking to players, parents, coaches and administrators, that question was topic 1 and 1a and many people already believe the that James Blake will get the job. Earlier this month in a news conference on the PowerShares series they are participating in, Andy Roddick endorsed James Blake for the position, and although not everyone is as enthusiastic as Roddick about Blake's candidacy, he is certainly on the short list. In the SI.com piece, I don't really predict anything, and ask more questions than provide answers, but I do hope the decision is made relatively soon so the adjustment period can begin for all involved. Tennis Channel has come up with its 10 to Watch in 2015, and the brief bios are available on video at the website. At this year's US Open, I was invited to participate in talking about the 10 players (only one American, Taylor Townsend, among them), but unfortunately all my comments ended up on the cutting room floor. 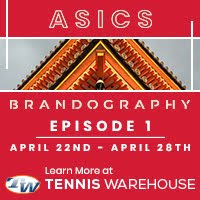 But many other knowledgeable members of the tennis community provided insights, so check out each one (if you can stand watching the Ally Bank advertisement 10 times). The Universal Tennis Rating has been providing its look at the fields of the Eddie Herr, Orange Bowl and now, the 16 & 18s Winter Nationals, ranking the competitors by their UTR. After the tournament is over, they provide analysis and identify the "rare" upset, which happens when a player with a UTR ranking more than 1.00 point lower than his or her opponent wins. The big upset at the Orange Bowl was Sonya Kenin's win over CiCi Bellis. 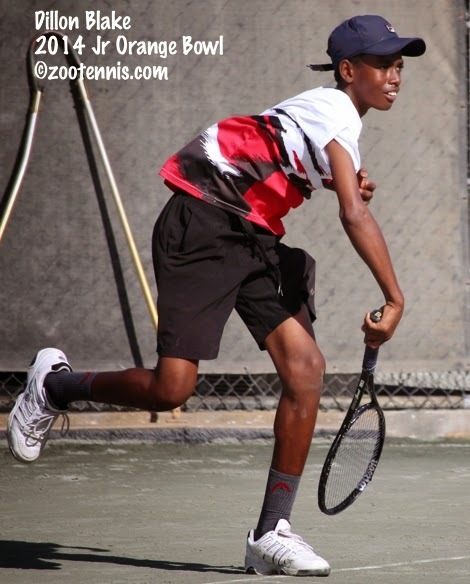 According the UTR, the top two players in the 18s Winter Nationals this year are Zeke Clark(seeded No. 11) and Sara Daavettila (seeded No. 5). The USTA Winter Nationals begin Saturday morning in Arizona, with Scottsdale (16s and 18s) and Tucson (12s and 14s) serving as the host cities again this year. The top eight seeds in each division are listed below. The draws can be found at the TennisLink site, with the 16s and 18s here, and the 12s and 14s here. 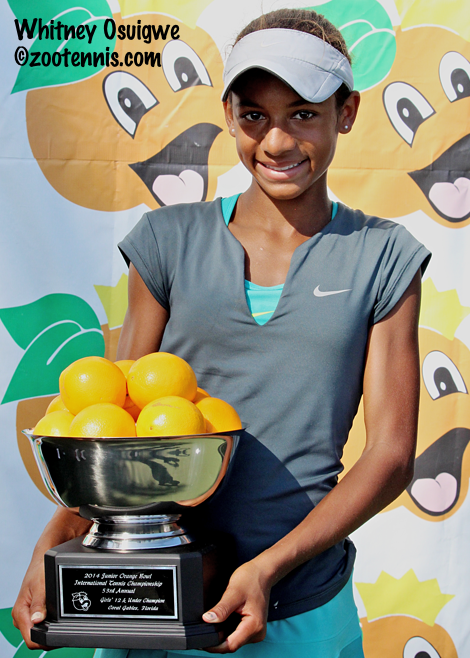 Whitney Osuigwe outshone the field in the girls 12s division, joining Junior Orange Bowl veterans Anastasia Potapova of Russia and Yshai Oliel of Israel in winning championships Tuesday at the Neil Schiff Tennis Center at the University of Miami. Moisture on the courts from heavy dew overnight delayed the start of the girls finals by two hours, and when Osuigwe finally did take the court against Himari Sato of Japan, a No. 1 seed, she was equally slow in getting started. But after trailing 3-1 in the opening set, Osuigwe began seeing the dividends of a strategy she'd developed from her third round loss to Sato at the Eddie Herr, and she went on to claim a 6-4, 6-4 victory. "I was smarter this time, knowing what to do after I had lost to her last time," said the unseeded Osuigwe, who trains at the IMG Academy in Bradenton, Florida. "I knew what works and what doesn't and I used my forehand more in hitting heavy spin balls to her backhand side." Sato began to contribute uncharacteristic errors to Osuigwe's cause, and after a tight first half of the second set, she was broken, giving Osuigwe an opportunity to serve out the match at 5-3. She was unable to do that, however, and she had a few choice words for herself during that changeover. "I told myself some negative things," said Osuigwe, who admitted difficulty keeping her focus when she was so close to the finish line. But the 12-year-old regrouped, breaking Sato to earn what she called her best win ever. "It feels good, because I've been trying to win it for three years," said Osuigwe, who has been invited to travel with the USTA to the Bolton Teen Tennis and Les Petits As tournaments next month. For the second-seeded Potapova, her 6-4, 6-3 win over No. 5 seed Bianca Andreescu of Canada allowed her to replace the memories of last year's girls 12s final loss to Hurricane Tyra Black with more positive ones. "Last year I lost here in the finals," said the 13-year-old, who also won the Eddie Herr title earlier this month. "I just think, second time, I can't lose." Andreescu, who was aiming to become the first girl to ever win both the 16s Orange Bowl title and the Junior Orange Bowl 14s title in the same year, started off well, leading 4-0 in the first set, before losing her focus and the next six games. "She just wanted it more than me today," said Andreescu, who lamented her lack of intensity. "I just kind of lost my focus a little bit. When I'm up, that's what I usually do. I think, oh it's easy, I'll just win these two games and that's it. But today, she just played a little bit better than me." Andreescu began to struggle with her first serve, and Potapova took advantage, taking control of the point when she had a look at a second serve. In the second set, Andreescu had opportunities to reassert herself, but she failed to convert two break points with Potapova serving at 3-2 and immediately lost her next service game. Potapova was unable to serve out the match, but she broke Andreescu, crushing a forehand winner to claim the title. After a two and a half hour semifinal win over Iga Swiatek of Poland, in which she saved a match point, Potapova admitted that she was feeling some mental and physical fatigue that contributed to her slow start. But once Andreescu's errors started to pile up, Potapova could relax and hit out, using her flat, powerful ground strokes to challenge Andreescu. "She made many mistakes," said Potapova, who will return home to Russia, then play Les Petits As in January. "I think it was not her day, but it was my day. I'm happy, I'm really happy." Unlike Potapova, Oliel had only good memories from his previous final, back in 2012, when he won the boys 12s at Salvadore Park over Patrick Sydow. But top seed said the second title was just as gratifying as the first, with a 7-5, 7-5 victory over unseeded Chen-jui Ho making him just the ninth boy to capture both the 12s and 14s Junior Orange Bowl titles. Oliel took leads in both sets in the battle of left-handers, but both times Ho fought back to even it. In each set however, it was Oliel who managed a break with Ho serving at 5-6. "It was a very tough match and Ho played very good," said Oliel. "I tried to move him a lot and not put the ball to his forehand, because it's very good. I tried to go for the backhand and open the court." In the second set, games went quickly, with neither player challenged much on his serve. Ho had a game point to take it to a second set tiebreaker, but Oliel hit an inside in forehand winner to get to deuce, and then pounded a backhand deep in the corner to force an error and to earn a match point. Oliel went to his forehand when he got the opportunity in the that final rally and eventually maneuvered himself into position to attempt a forehand winner, which just clipped the tape, but landed in, to give him the victory. "His ball is different from anybody," said Ho, who trains at the Sandpiper Bay Club Med Tennis Academy in Port Saint Lucie, Florida, two hours north of Miami. "He has more spin, and he's lefty. And my fitness, it's not there yet. I need to improve, so I can play longer and longer. But congrats to Yshai, and I will get better and better." Oliel returned to the 14s for this tournament after playing the ITF at the Eddie Herr, qualifying and winning a round before falling to No. 7 seed Chan-yeong Oh of Korea in three sets. "You have a lot of pressure," said Oliel, who did not drop a set in the tournament. "But I focus on every match. I don't say I will win the tournament, but focus on every match, every point, every game, and try to do my best again. I don't think about it. I know I have to play good, don't be angry, try always to be happy in the game." Oliel will return to Israel to celebrate, then head back across the Atlantic for ITF Junior tournaments in South America next month. The boys 12s champion Borna Devald of Croatia, who defeated Ross Weibull of Sweden 6-1, 6-0 in the final at Salvadore Park, received a message from his namesake Borna Coric wishing him good luck prior to the final. Coric, who was a finalist in the 14s in 2010 and is now in the ATP Top 100, has served as an inspiration to Devald. "We played one time," said Devald, a No. 1 seed. "Just tiebreak. It was very fun. He won." Devald, who lost only one set in his seven wins this tournament, said he played his best in the final. "Match by match, I play better and better, and in the final, it was my best match of the tournament," said Devald. "It's a pleasure to play here." Wiebull, a No. 9 who twice came from a set down to advance to the final, simply met his match in the final, according to his father Tobbi. "Coming into the match he was playing marvelous, but [Devald] did not give Ross a chance to come into the match. If you want to beat him, beat him big. And that's what the guy did." 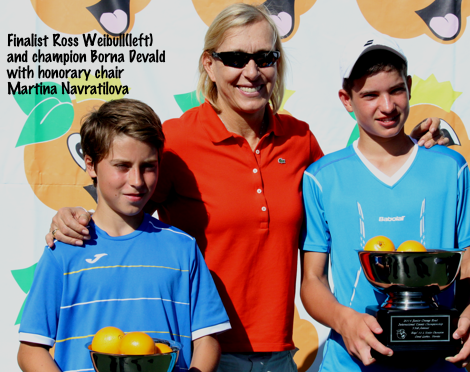 Wiebull and Devald were presented their trophies at the University of Miami by this year's Junior Orange Bowl honorary chair Martina Navratilova. The results of the third place matches and feed-in consolation finals are below. For complete draws, see the TennisLink site. Bianca Andreescu of Canada is on the verge of making history, as she seeks to become the first girl to win both the Orange Bowl 16s and Junior Orange Bowl 14s title in the same year. Andreescu, the No. 5 seed, will need to get by No. 2 seed and Eddie Herr champion Anastasia Potapova of Russia, who advanced to the final by saving a match point in her 6-2, 3-6, 7-6(6) thriller with No. 9 seed Iga Swiatek of Poland. Now on an 18-match winning streak with an ITF Grade 4 title in South Carolina prior to her Orange Bowl 16s championship nine days ago, Andreescu reached the final by defeating No. 4 seed Taylor Johnson of the United States 7-6(1), 6-3 in Monday's semifinal at the Neil Schiff Tennis Center at the University of Miami. Andreescu was up 5-4 40-0 in the opening set, but Johnson fought back, only to see Andreescu raise her level in the tiebreaker. It was all Andreescu early in the second set, as she built a 4-0 lead, but again Johnson, a left-hander who trains at the RAMP Academy in Carson, California, battled back. After winning two straight games, Johnson was a point from getting back on serve in a six-deuce game, but Andreescu saved three break points to keep her lead and went on to serve out the match. "I was a little bit sloppy and missing a lot," said Andreescu, who trains with Tennis Canada in Toronto. "I was a little bit stiff, so I was missing more, but I kept moving and it was good." Andreescu, who also won the Les Petits As title early this year, attributes all her success lately to one thing. "I'm really focused, and that's helping me a lot." Potapova, who reached the 12s final last year, was honest in her assessment of how she got through her match with Swiatek, with luck and Swiatek's errors playing a significant role. Up 5-3 in the final set tiebreaker, after two and a half hours of heavy hitting in the 80 degree heat, Potapova lost three points in a row to give Swiatek a match point. But Swiatek missed a cross court backhand wide, and two points later, Swiatek hit a forehand just long to end the match, which led to her collapsing on the court, sobbing while Potapova waited patiently at the net to shake hands. "She made three mistakes in a row," said the 13-year-old Potapova, who admitted she was able to stay patient near the end of the match. "I feel lucky, of course. But I just play my game and that's great." Potapova and Andreescu have never played, but both have an idea of what to expect. "Of course, I know her very well," said Potapova, who is looking to become the first girl to win the 14s Eddie Herr and Orange Bowl titles in the same year since Hanna Orlik of Belarus in 2006. "She was in Tarbes (Les Petits As) and in World Cup (ITF Junior Tennis team competition), so I know her well. She's a very good player." Andreescu said her coach would be giving her some tips on how to play Potapova. "All I know is that she likes to hit hard and flat," said Andreescu. "And she's emotional on court. My coach has watched her a little bit and will tell me how to play her tomorrow." Andreescu says her lack of emotion on the court comes naturally to her. "I try to be calm, but sometimes, on the inside when I miss, it's like what are you doing," Andreescu said. "But I try not to show it, so my opponent won't feel up." 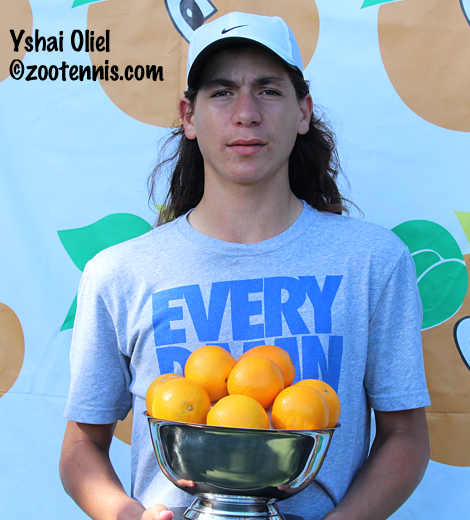 Top seed Yshai Oliel of Israel will go for his second Junior Orange Bowl championship, after the 2012 12s champion defeated No. 7 seed Roscoe Bellamy of the US 6-1, 6-2. "The weather today was the best to play," said Oliel, who has yet to drop a set in the tournament. "I played great--aggressive without many mistakes. I did great serves in the beginning of the match and it gave me a lot of confidence to try more with my forehand, backhand, volley." Despite his experience in an Orange Bowl final, Oliel does not believe that will be any advantage for him in Tuesday's final, against unseeded Chen-jui Ho of Taiwan. "I'll just try to do my best tomorrow, and that's it." Ho, who defeated No. 2 seed Sebastian Baez of Argentina 6-4, 6-3, used the fact that he was unseeded as motivation throughout the week. "At the beginning of the tournament, they didn't put me seeded," said the left-hander, who trains at the Club Med Sandpiper Bay in Port Saint Lucie, Florida. "They don't think I can play that good. But I use my tennis to prove that I can get into the final." As he has done throughout the tournament, Ho used his size and power to punish his smaller opponent. "I'm a big guy, and my forehand his very powerful," said Ho, who has yet to drop a set in the tournament. "I try, for 80 percent of the court, to use my forehand to hit and let them feel that pressure, try to handle my ball." As for his strategy against Oliel, Ho isn't tipping his hand. "I think I'm going to think about it tonight," Ho said. "We are pretty good friends, but on the court we are opponents, and I'm going to do my best tomorrow." Whitney Osuigwe is the lone American finalist, advancing to the girls 12s championship match with a 6-4, 6-1 victory over 10-year-old Cori Gauff, also of the US, at the Neil Schiff Tennis Center at the University of Miami. Osuigwe, who is 12, is not accustomed to seeing younger opponents across the net, especially in the later stages of a tournament, and that experience contributed to her slow start. "I got nervous in the beginning," said Osuigwe, who trains at the IMG Academy in Bradenton. "Because she's younger, and she's good. She was playing really well, and I just had to get my mind back into the game, tell myself I could do it." After the first half of the first set, Osuigwe said she settled down. "I went down 3-0 and then I came back and she started playing better, so I had to step up my game. I had to move the ball around and get her upset, so I could take control of the match." Although Osuigwe isn't seeded, she believed that she could go deep in the tournament, and that conviction has led her to a rematch with Himari Sato of Japan, who beat her 6-4, 7-6(2) in the third round of the Eddie Herr earlier this month. Sato, who defeated Alina Charaeva of Russia 6-3, 6-4 in Monday's semifinals, is aiming to become the first Eddie Herr 12s champion to win the Junior Orange Bowl in the same year since Madison Keys did it in 2007. Osuigwe is ready for another shot at Sato, but isn't planning on any changes in her strategy. "She just played good," said Osuigwe. "I just have to do what I did, maybe a little bit better." At the boys 12s at Salvadore Park, the title will be decided between Borna Devald of Croatia, a No. 1 seed, and Ross Weibull of Sweden, a No. 9 seed. Devald defeated Daiki Yoshimura of Japan, a No. 9 seed, 6-2, 6-3 in Monday's semifinals and Weibull ousted Jeffrey von der Schulenburg of Switzerland, a No. 1 seed, 6-4, 6-3. The boys 12s consolation final was decided in favor of Aidan Mayo, a No. 9 seed from the US, when unseeded Spencer Brachman of the US was unable to compete in the match for fifth place. Mayo had defeated Benjamin Heynold of Great Britain to advance to the final, while Brachman had beaten Nicholas Garcia of the US, a No. 1 seed, 6-1, 6-2. For complete results, see the TennisLink site. For additional coverage, see the tournament website. Bianca Andreescu had three days to rest after winning the Orange Bowl 16s title in Plantation, Florida, and she did what any snowbird would to enjoy the beautiful December weather: she went to the beach. That day off and two days of light hitting on hard courts were all the 14-year-old Canadian needed to prepare for the Junior Orange Bowl, and on Sunday she reached the semifinals with a 6-4, 6-3 win over top seed Olesia Pervushina of Russia at the University of Miami Neil Schiff Tennis Center. "After that tournament, I just refocused and started over in this tournament," said Andreescu. "And it's working." Even after winning the 16s Orange Bowl on the Har-Tru clay at the Veltri Tennis Center, Andreescu said she preferred hard courts, and now that she is back on them, she's even more comfortable. "I move better on hard court and my shots are more effective," Andreescu said. "My shots move through the court better." Pervushina wasn't at her best, but many of her errors were forced by Andreescu, who had no trouble with the Russian's pace of shot. The fifth-seeded Andreescu played aggressively, moved in when she had the opportunity and was especially impressive with her swinging volleys. "I was putting a lot of pressure on her and she was just missing a lot," said Andreescu, who broke Pervushina to end the match. Next up for Andreescu is No. 4 seed Taylor Johnson of the United States, who defeated unseeded Ulyana Shirokova of Russia 7-5, 4-6, 6-2 in long, physical match. Johnson is the only US girl to survive the quarterfinals, with Iga Swiatek of Poland beating fellow No. 9 seed Anna Brylin 6-2, 6-4 and No. 2 seed Anastasia Potapova of Russia downing No. 6 seed Caty McNally 5-7, 6-3, 6-0. Potapova had beaten McNally in three sets in the Eddie Herr final earlier this month, but this time Potapova, last year's 12s finalist, dropped the first set. Serving for the set at 5-4, a slew of unforced errors came off Potapova's racquet and she lost the last three games of the set. But she regrouped to dominate the final two sets, finding her rhythm and range on her big ground strokes. Top seed Yshai Oliel of Israel has yet to drop a set in the tournament, reaching the semifinals with a 6-1, 6-4 win over No. 5 seed Brian Shi of the United States. Oliel, the 2012 boys 12s champion, will play another American, his third in a row, on Monday, after Roscoe Bellamy defeated unseeded Tao Mu of China 6-2, 6-4. The seventh-seeded Bellamy, who also hasn't lost a set in advancing to the semifinals, served his way out of trouble throughout the match, and passed well when Mu approached the net. "I thought I did a pretty good job of getting it low when he came in, doing the right thing on that," Bellamy said. "He did have good volleys, so that helped him with a few shots. He couldn't really hurt me that much from the baseline, so I think that was smart from him, actually." Bellamy, who reached the semifinals of the Eddie Herr, called his position as the last American "a privilege." "But I want to do something with it," Bellamy added. "I think I have a good shot at winning this and I want to do that." No. 3 seed Keenan Mayo of the United States was ousted by unseeded Chen-jui Ho 6-3, 6-3, unable to counter the power of the left-hander from Taiwan. Ho will play No. 2 seed Sebastian Baez of Argentina, who defeated unseeded Chun-Hsin Tseng of Taiwan 6-0, 6-4. The greatest number of American quarterfinalists were in the boys 12s division, but all four of them lost on Sunday at Salvadore Park. Aidan Mayo fell to fellow No. 9 seed Ross Weibull of Sweden 2-6, 6-1, 6-1. Unseeded Saud Alhogbani went out to Jeffery von der Schulenburg of Switzerland, a No. 1 seed, 7-5, 7-6(0) and two No. 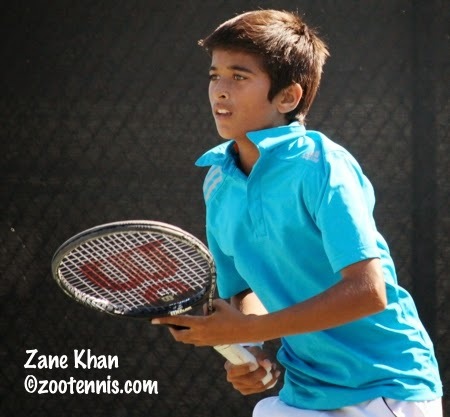 1 seeds from the US, Zane Khan and Nicholas Garcia lost, Khan to No. 1 seed Borna Devald of Croatia 6-3, 6-1 and Garcia to No. 9 seed Daiki Yoshimura of Japan 2-6, 6-0, 6-3. An American finalist is the girls 12s is assured, with two unseeded players, Whitney Osuigwe and Cori Gauff, moving through to face each other in the semifinals, which will be played at the University of Miami after five days of competition at Tropical Park. Osuigwe defeated Qinwen Zheng of China, a No. 1 seed, 6-1, 6-4 and Gauff, just 10 years old, defeated Canadian qualifier Leylah Fernandez 6-0, 3-6, 6-2. The top half semifinal will feature Eddie Herr champion Himari Sato of Japan against Alina Charaeva of Russia. Sato, a No. 1 seed, defeated unseeded Charlotte Owensby 6-2, 6-3 and Charaeva, a No. 9 seed, beat No. 1 seed Carol Plakk of Estonia 6-2, 6-1. Main draw matches begin at 11:00 a.m. on Monday at the University of Miami and at 11:30 a.m. at Salvadore Park for the boys 12s. Saturday was my last day of reporting on the Junior Orange Bowl boys 12s competition, which is played on the Har-Tru courts at Salvadore Park, because unlike the other divisions, they will not move to the University of Miami hard courts for the tournament's final rounds. I picked a good day to spend there however, with two matches ending in third-set tiebreakers, including Saud Alhogbani's 4-6, 6-3, 7-6(2) upset of Eddie Herr champion Jungwon Park, a No. 1 seed. The match, which began at 10:30 a.m. and finished at 1:40 p.m., was full of momentum shifts, but Park knew he was in a battle from the start. With a size advantage over everyone in the field, Park used his power to overwhelm his previous opponents, but Alhogbani was not going to let that happen to him. "He usually just powers on these kids since he's so tall and cover the court well," said Alhogbani, who lives in Washington DC and trains at the Junior Tennis Champions Center in College Park, Md. "I thought maybe if I could match his power back, then I could mix it up, kicks, slices and he didn't really like that." Alhogbani didn't allow Park to develop any rhythm, and often pushed Park back near the fence with moonballs. On several occasions, even with his height, Park couldn't reach those balls to return them, and he seemed uncomfortable taking balls early or out of the air to counteract Alhogbani's strategy. Alhogbani trailed 3-1 in the final set, but won four games in a row, as Park struggled to keep the ball in the court. Alhogbani served for the match at 5-3, but Park was more aggressive in that game, and Alhogbani chipped in with a few errors. Park held for 5-5, and began to drop shot Alhogbani effectively, although he began to look tired as both boys held for a tiebreaker. Park took a 2-1 lead with a drop shot winner and an overhead winner that he made with a broken string. That was the last point he would win however, as his forehand went AWOL and he made six straight errors to give Alhogbani the victory. "Clay is a little bit more of a patient game," said Alhogbani, who recently won an Asian Tennis Federation tournament in Qatar, taking the title match 7-6 in the third. "So I just thought keep on rallying deep, and find a way to win this tiebreaker." "I was preparing for this tournament for a year, hopefully to knock out one of the 1 seeds," Alhogbani added. "I can't believe I beat the Eddie Herr champion." Alhogbani will play another No. 1 seed in Sunday's quarterfinals, Jeffrey von der Schulenburg of Switzerland. Two No. 1 seeds will clash in the bottom half, with American Zane Khan playing Borna Devald of Croatia. Khan defeated No. 9 seed Michael Eala of the Philippines 6-1, 6-4 and Devald put an end to the run of qualifier Alexander Bernard of the US 6-1, 6-0. American Aidan Mayo, a No. 9 seed, will play Ross Weibull of Sweden, also a No. 9 seed, after both came back from a set down to win in three. Weibull beat Spencer Brachman 0-6, 6-3, 6-3 and Mayo, whose brother Keenan is in the 14s quarterfinals, downed unseeded Juan Zabala Vargas 4-6, 6-1, 6-3. The fourth quarterfinal will feature No. 1 seed Nicholas Garcia of the US against No. 9 seed Daiki Yoshimura of Japan. Yoshimura won the day's second match ending in a third-set tiebreaker, hitting three straight forehand winners down 4-5 in the tiebreaker to claim a 6-2, 0-6, 7-6(5) win over unseeded Benjamin Heynold of Great Britain. Garcia beat unseeded Korean Donglu Kim 6-3, 6-4, citing his willingness to come forward as a key to his win. "When I moved in I gave him some trouble," said Garcia, who trains with the USTA in Boca Raton. "I was hitting my forhand well, opening up the court well." Garcia, who reached the semifinals of the Eddie Herr, losing to Park, said he prefers the Junior Orange Bowl clay to the Eddie Herr hard courts. "I actually like clay more, because I like sliding," said Garcia, a left-hander with a one-handed backhand. "On clay courts you have to take your time and build the points more and you can't finish the points as fast." In each of the other three divisions, three Americans have advanced to the quarterfinals. In the girls 12s at Tropical Park, unseeded Charlotte Owensby, Whitney Osuigwe and Cori Gauff won their fourth round matches in straight sets. Unlike Park in the boys 12s, the Eddie Herr champion in the girls 12s is still alive, with Himari Sato of Japan advancing to play Owensby. The only qualifier still playing the main draw of any of the divisions is Canadian Leylah Fernandez, who beat Eddie Herr finalist Helene Pellicano of Malta on Friday and Eva Garkusha of Russia today. Her next opponent is 10-year-old Cori Gauff. The girls 12s will stay at Tropical Park for their quarterfinal matches, moving to the University of Miami on Monday for the semifinals, but the girls 14s will shift sites Sunday to the University of Miami. One of the best matches of the day Sunday is a rematch of the Eddie Herr final, with No. 6 seed Caty McNally of the US taking on Eddie Herr 14s champion Anastasia Potapova of Russia. McNally has been cruising through the draw in the first four rounds, losing just four games, and she defeated Russian qualifier Vasilisa Belonog 6-0, 6-1 Saturday. Potapova got by No. 9 seed Elysia Bolton of the US 6-4, 6-3. Top seed Olesia Pervushina of Russia also will be tested Sunday, playing Orange Bowl 16s champion Bianca Andreescu of Canada, the No. 5 seed. Pervushina won her fourth round match over unseeded Amanda Anisimova of the US 4-6, 6-2, 6-3. Taylor Johnson(4) and Anna Brylin, a No. 9 seed who defeated No. 3 seed Emiliana Arango of Colombia Saturday, are the other two Americans joining McNally in the quarterfinals. 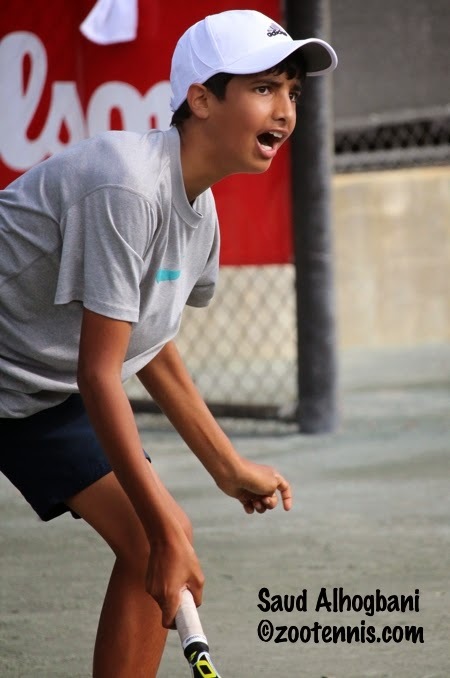 2012 Junior Orange Bowl 12s champion Yshai Oliel of Israel, the top seed in the 14s this year, has reached the quarterfinals, where he will meet No. 5 seed Brian Shi of the US. Oliel defeated William Woodall of the US 6-2, 7-6(3) and Shi, the Eddie Herr 14s finalist, downed Christian Alshon of the US 6-2, 6-2. No. 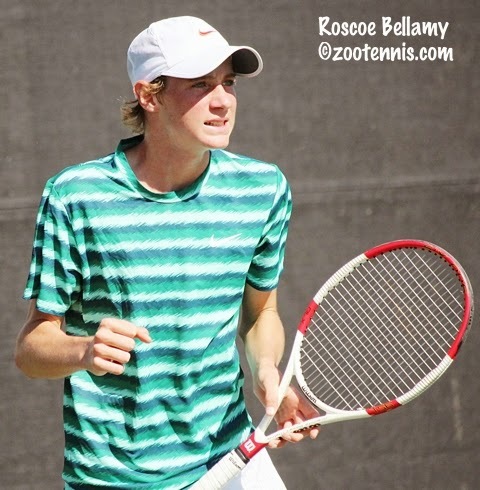 7 seed Roscoe Bellamy will face unseeded Tao Mu of China, who beat No. 17 seed Steven Sun of the US 4-6, 6-1, 6-1. Bellamy advanced with a 6-1, 6-2 victory over No. 8 seed Igor Gimenez of Brazil. No. 3 seed Keenan Mayo beat No. 17 seed Daniel Michalski of Poland 6-4, 6-7(2), 6-1 and will play unseeded Chen-jui Ho of Taiwan, who defeated No. 9 seed Egor Noskin of Russia 6-3, 6-3. The fourth quarterfinal features unseeded Chun-Hsin Tseng of Taiwan, who beat Andrew Fenty of the US 6-1, 6-1, against No. 2 seed Sebastian Baez of Argentina. Complete draws can be found at the TennisLink site. For additional coverage, see the tournament website. 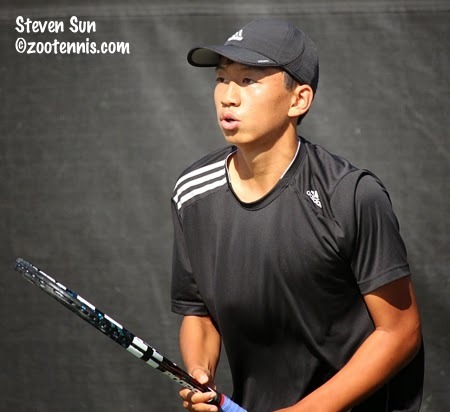 Steven Sun didn't have to wait long for his opportunity to avenge his recent Eddie Herr quarterfinal loss to No. 4 seed Nicolas Mejia of Colombia. Meeting in the round of 32 (the fourth round in the new 192-draw for Boys 14s this year) on another clear and warm day at the University of Miami's Neil Schiff Tennis Center, Sun came through with a 6-4, 7-6(1) victory, without making many changes to his game. "I got thoroughly beaten at Eddie Herr," said Sun, who lost 6-3, 6-2. "I didn't do anything differently, I just executed better." Sun passed well all day, and on match point hit a dipping forehand pass from well behind the baseline for a clean winner. Sun said he and his new coach Andres Pedroso, the former University of Virginia men's assistant, worked hard in the week between the Eddie Herr and Orange Bowl, and he is now feeling comfortable on the court. Sun, originally from New York but now living in Boca Raton, said his two tough three-set wins prior to his victory over Mejia, helped him get his revenge. "I think it helps, just to get in a rhythm," said the No. 17 seed, who won the Easter Bowl earlier this year. "It takes a couple of rounds to feel out the courts and stuff." Roscoe Bellamy, the No. 7 seed, had very little opportunity to do that in his first two matches, winning both his previous matches 6-0, 6-0. On Friday, Bellamy was tested by unseeded Luka Vukovic of Canada, but came through with a 6-3, 7-6(3) victory. Bellamy gave credit to Vukovic for breaking the string of 25 straight games won to start the tournament. "He made a lot more balls and he was a lot more aggressive and could do more with the ball," Bellamy said, when asked how Vukovic compared to his previous two opponents. Vukovic served for the second set at 5-4, and had set points, but Bellamy hung on to get the game when Vukovic double faulted. In the tiebreaker, Bellamy had a slim 4-3 lead, but earned three match points with an excellent drop shot winner and a good first serve, converting the first match point when Vukovic's forehand went wide. "I definitely didn't play my best the whole entire match," said Bellamy, who admitted he did briefly think about the loss of his first game of the tournament, "but I started competing a little better at the end." Bellamy, a semifinalist at the Eddie Herr, was disappointed with the way that tournament ended for him. "I thought I could have won the match I lost in the semifinals (to Mejia)," Bellamy said. "I played Nicolas, he's a good player, and had a tight match with him, but either set could have gone either way." Sun and Bellamy are joined in the round of 16 by fellow Americans William Woodall(9), Christian Alshon(9), Brian Shi(5), Keenan Mayo(3) and unseeded Andrew Fenty, who has lost only 12 games in his first four matches. The only all-American match on Saturday is Alshon vs. Shi. Woodall plays top seed Yshai Oliel of Israel, who beat Karlo Suevich(17) of Croatia 6-1, 6-1. In the boys 12s, six US boys advanced to the round of 16, including all three seeds. No. 1s Zane Khan and Nicholas Garcia advanced in straight sets, and No. 9 seed Aidan Mayo, Keenan's younger brother, moved on when Faris Khan retired with a back injury trailing 6-1, 2-1. Unseeded Spencer Brachman and Saud Alhogbani reached the fourth round, as did qualifier Alexander Bernard. At the girls 14s, the Top 7 seeds all won, including No. 4 seed Taylor Johnson and No. 6 seed Caty McNally of the US. Ninth-seeded Americans Elysia Bolton and Anna Brylin reached the fourth round, as did unseeded Amanada Anisimova, who will play top seed Olesia Pervushina of Russia in Saturday's round of 16. Bolton faces No. 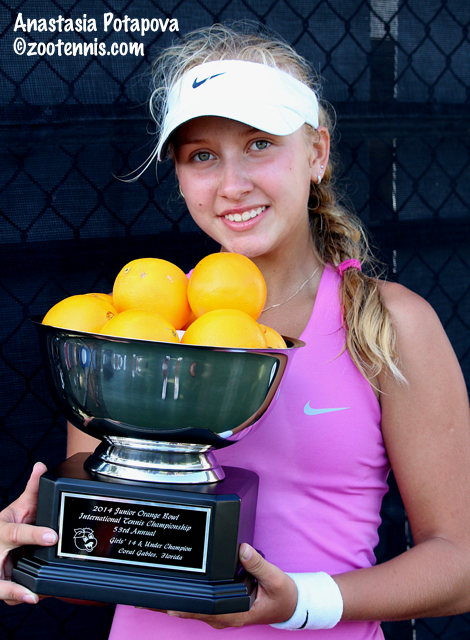 2 seed Anastasia Potapova, the Eddie Herr 14s champion. Six US girls have reached the round of 16 in the 12s at Tropical Park, including Alexa Noel, one of the eight No. 1 seeds. She is joined by No. 9 seeds Gabriella Price and Victoria Hu, and unseeded Charlotte Owensby, Whitney Osuigwe and Cori Gauff. 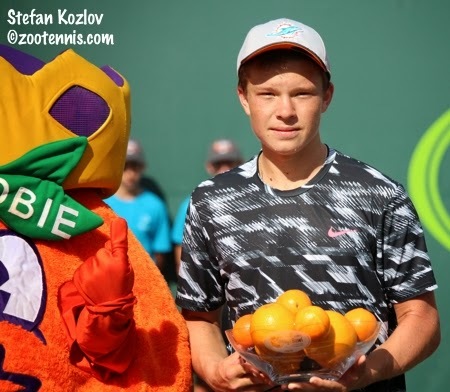 Before I head out for third round action at the Junior Orange Bowl, it's time to wrap up last week's Metropolia Orange Bowl. 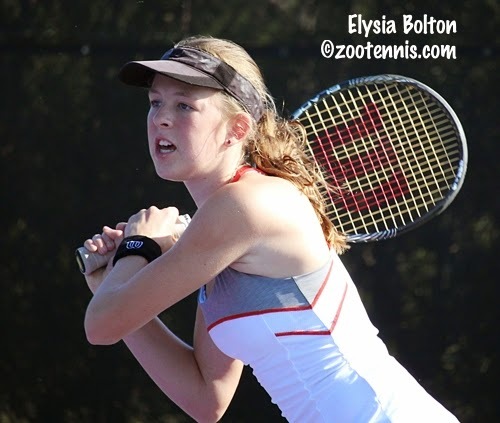 My recap for the Tennis Recruiting Network is available now. The singles quarterfinalists and doubles semifinalists are featured in the slideshow, and videos of the champions are also below. As with the Eddie Herr finalists, those videos will be posted early next month. The acceptances for the 2015 Australian Open Junior Championships, which will take place January 24-31 in Melbourne, were released Wednesday. As usual for any junior slam, the list of those competing is unlikely to include everyone on the current acceptance list, and with the withdrawal deadline January 13th, the field won't really shape up until after that. CiCi Bellis entered, but is not expected to play, opting instead for Pro Circuit events in the US. Other US girls accepted into the main draw are: Orange Bowl champion Sonya Kenin, Raveena Kingsley, Usue Arconada and Michaela Gordon. Jessica Ho, Mia Horvit, Raquel Pedraza, Madison Bourguignon and 2013 quarterfinalist Olivia Hauger have been accepted into the qualifying. 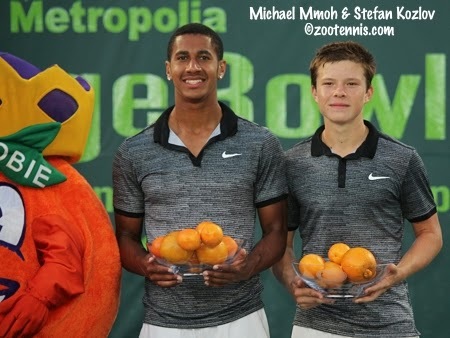 US boys on the acceptances list include Taylor Fritz and Michael Mmoh, who told me at the Orange Bowl that they intend to play it, with Reilly Opelka, William Blumberg and Sameer Kumar also receiving acceptance into the main draw. Kalman Boyd is the only American currently in the qualifying, although Ulises Blanch is just one spot out of qualifying, and will certainly move in as withdrawals happen. One of the most intriguing names on the boys acceptance list is 17-year-old Roman Safiullin of Russia, who has won four straight Futures and is now ranked 333 on the ATP computer. The complete acceptance lists can be found at the ITF junior tournament page. I spent the second day of the Junior Orange Bowl at Key Biscayne's Crandon Park, the site of the Girls 14s tournament's early rounds. I saw at least a few points of all the main draw matches, but I was also committed to updating my photo library, so I didn't stay at any match long. The vast areas between courts counterbalances the excellent viewing and camera positions, but toward the end of the day, I was able to sit down for a few minutes and watch two Midwest girls, playing side by side. No. 6 seed and Eddie Herr 14s finalist Caty McNally had no trouble in her match with Daria Lukyanova of Russia, breezing to a 6-1, 6-0 victory in the afternoon's warm sunny and calm conditions. Elysia Bolton, one of eight No. 9 seeds, had more difficulty with the hard-hitting Varvara Gracheva, also of Russia, but Bolton came through with a 6-3, 6-3 victory. Russia had plenty of winners however, with top seeds Olesia Pervushina and Anastasia Potapova both advancing in straight sets. The only top eight seeds failing to reach the round of 32 was No. 8 Olga Danilovic of Serbia, who lost to Dalila Said of Egypt 1-6, 6-4, 6-1. Last year's 12s champion, Hurricane Tyra Black, who received a wild card into this year's tournament, lost to No. 3 seed Emiliana Arango of Colombia 3-6, 6-3, 6-3. Two Top 8 seeds lost in the Boys 14s, with No. 8 seed Marko Miladinovic of Serbia losing to Chen-jui Ho of Taiwan 6-2, 6-3 and No. 6 seed Patrick Sydow of Venezuela, an Eddie Herr 14s semifinalist, falling to Andrew Fenty of the US 6-1, 6-3. In the 12s, Spencer Brachman of the US, an Eddie Herr quarterfinalist, defeated No. 1 seed Shunsuke Mitsui of Japan 6-2, 6-2. And in a long and dramatic match that finished under the lights at Salvadore Park, Benjamin Heynold of Great Britain took out Eddie Herr semifinalist Dawid Taczala of Poland 6-4, 2-6, 6-4. Heynold and Taczala battled for over three and half hours, with Taczala going up 2-0 in the third set, only to lose four straight games. He got the break back, but in the eighth game, Heynold appeared to cramp or pull a muscle in his calf. After a long, tough point, he crumpled in tears on the service line, receiving medical attention from the trainer, but he continued, and Taczala was broken when the game resumed. Heynold, not looking as energetic as he had earlier, managed to hold serve to win the match, with Taczala's aggressive errors ending most of the points. In the girls 12s, the only No. 1 seed to fall was Naomi Cheong of the US, who lost to 10-year-old Cori Gauff, the reigning USTA 12s Clay Court champion, 7-6(8), 6-2. Complete results can be found at the TennisLink site. Check the Junior Orange Bowl website for more coverage. 2. Creates Direct Acceptance List: Creates a Direct Acceptance List of top USTA, ATP/WTA and ITF* players to be published on May 1 that will automatically be selected for the Boys' and Girls' 18 and 16 USTA National Clay Court Championships and The USTA National Championships. ATP/WTA and ITF players are only included on the Direct Acceptance List for the 18 Divisions. Up to 32 players are selected off of this list for the 18 Divisions; up to 16 players are selected off of this list for the 16 Divisions. In the 18 Divisions, the Direct Acceptance List will be comprised of the top 16 players on the National Standings List, followed by players with top 800 ATP ranks/top 600 WTA ranks, followed by top 100 ITF players. Up to 32 players will be selected by this method. If fewer than 32 players on the List enter, the open spots are filled with endorsed players from the National Standings List published at the time of selection. 3. Net Increase in Draw Size to Section Quota: The net increase in draw size is allocated to Sectional Association quota using the same quota formula that currently exists (60% based on strength of Section/40% based on size of junior membership as of December 31, 2013). 4. Sectional Ranking Tournament Winner Always Replaced with Quota Player: If the winner of the designated Sectional Ranking Tournament (May/June Sectionals) does not enter The USTA National Championships (Hard Courts) or is not age eligible, one additional player from the Section's endorsement list will be selected. This proposed change applies to all divisions (BG12-18). With the elimination of the qualifying tournaments, the previously published 2015 dates for the Clays and Nationals will not be accurate, so look for revisions there in the upcoming months. Today was the first day of the Junior Orange Bowl main draw and I spent most of the day at the Boys 12s in Salvadore Park. The only division to play on Har-Tru, the boys 12s had their usual variation in size, strength and skill level. Of the eight No. 1 seeds, seven won easily, and one, Ilya Tirapolsky of Canada, lost to Juan Zabala Vargas of Ecuador 7-5, 6-0. Eddie Herr champion Jungwon Park of Korea, a No. 1 seed, breezed through his match, and Zane Khan, Eddie Herr finalist, beat Christopher Li of Peru 6-1, 6-1. Li hit the ball hard and at time challened Khan, but made many more errors, particularly in extended rallies. The other No. 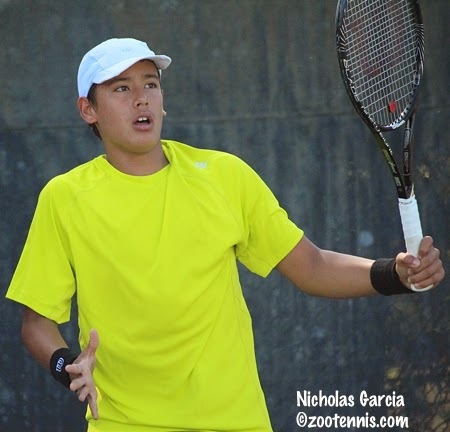 1 seed from the US, Nicholas Garcia, also won, beating Matthew Melosch of Germany 6-1, 6-0. The third US player seeded, Aidan Mayo, one of eight No. 9 seeds, defeated Mathias Musil of the Czech Republic 6-3, 6-3. Unseeded Benjamin Kittay of the US defeated No. 9 seed Alexander Mandma of Estonia 2-6, 6-0, 7-5. 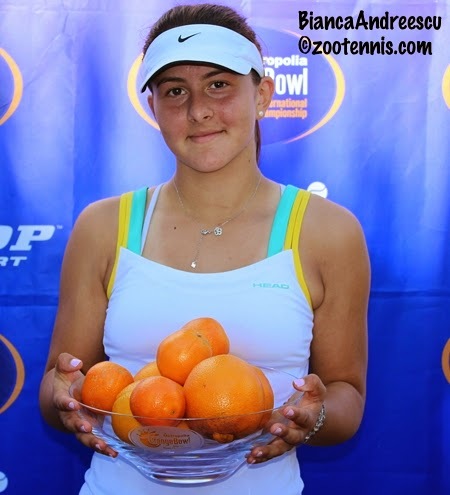 The top eight seeds in the Girls 14s all advanced, with Orange Bowl 16s champion Bianca Andreescu of Canada, the No. 5 seed, among them. Andreescu was not entirely certain she would play after winning in Plantation last Saturday. Olesia Pervushina and Anastasia Potapova of Russia are the top two seeds. All top eight seeds in the Boys 14s seeds also won their first matches in the 192-draw. 2012 12s champion Yshai Oliel of Israel and Sebastian Baez of Argentina are the top two seeds. Keenan Mayo(3) and Roscoe Bellamy(7), the two US boys in the Top 8, lost only one game between them in their matches this afternoon. In the girls 12s, played at Tropical Park this year, seven of the eight No. 1 seeds made the second round, with Luisa Meyer auf der Heide of Germany who retired with an injury in the first set of her match with Savannah Broadus of the US, the only one who didn't advance. I will be posting the videos of the Eddie Herr and Metropolia Orange Bowl finalists next month, when I return home and have more time. At the ITA convention this past weekend, the decision to retain the format previously approved for college tennis this summer--no-ad for singles and doubles, with three doubles matches decided by one six-game set, and six singles matches with best two out of three sets--was approved by the ITA Operating Committee. It appears the originally approved clinch/clinch rule, which would leave singles matches unfinished when a team reaches four points, has been amended to require completion of all singles matches, although conference rules still take precedence. Although the NCAA is barely mentioned in the release below, they hold the keys to the format played at the spring championships in May, and when tabling this format the first time back in September, they asked the NCAA Tennis Committee to provide more input from student-athletes, who were to be surveyed on the format issue. I have not heard if that survey has been completed and provided to the NCAA Championships Cabinet, which is meeting in February to decide whether to approve the format change for the 2015 Championships. Since the ITA announcement, I have spoken with dozens of college coaches and others about the format change. I have tried to keep an open mind, but I am unconvinced that no-ad will in any way enhance college tennis. I believe the win-by-two scoring in tennis is fundamental to its integrity and that adopting no-ad will deemphasize many of the physical and mental factors that make tennis so compelling. It favors one style of tennis over another, and presumes that it will shorten matches, although no hard data to support that has been released. As I said back in August, I will not travel to cover this format, as I personally do not enjoy watching it, and as an independent journalist, I have the freedom to make that decision. Although I am not optimistic, I hope the no-ad proponents will find the casual fans they are looking for with this change. 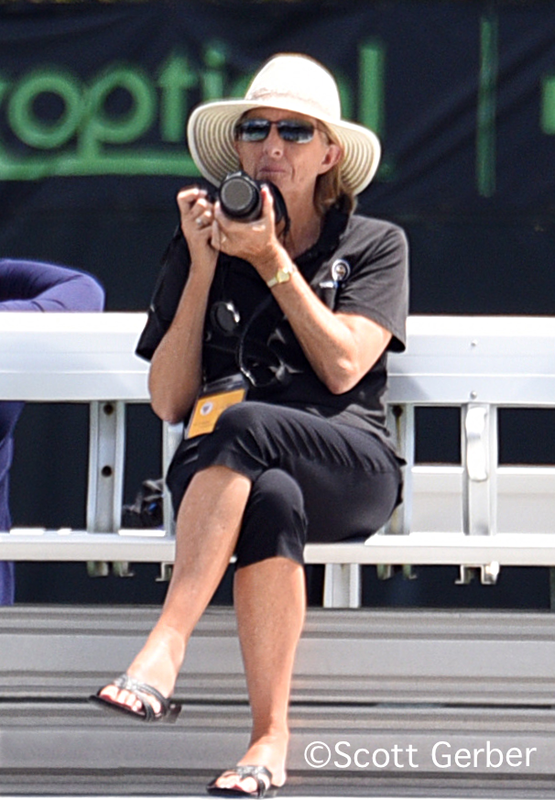 But this avid fan is saying goodbye to Division I tennis. 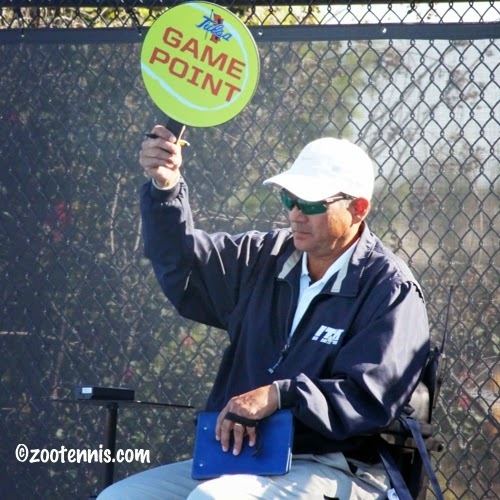 NAPLES, FL (Dec. 15) - The ITA Division I Operating Committee moved to re-submit its dual match format proposal to the NCAA Division I Tennis Committee for the 2015 NCAA Division I Team Championships during its final meeting of 2014 on Saturday, Dec. 13. This decisive vote (25 yes, 0 no, 9 abstentions) - supported by the USTA and the USTA's Athletic Directors Advisory Council - is a powerful indication of the group's commitment to adopt creative and innovative measures to enhance the sport of tennis during this time of seismic change in collegiate athletics. In addition the ITA Operating Committee voted 26-8 in favor of playing the shortened format during the 2015 ITA Kick-Off Weekend and 2015 ITA Division I National Men's and Women's Team Indoor Championships. Also, the Committee voted to adopt (30 yes, 0 no, 4 abstentions) the shortened format for all non-conference dual match competition with all singles matches being played to completion (doubles will remain "clinch"). It should be noted that NCAA conference rules supersede ITA rules, and therefore any conference can decide to not play the ITA format if it should so wish. The ITA Operating Committee felt that it was very important for Division I men and women's tennis to play with the same format - one that would enhance the student-athlete experience, be more fan-friendly, be more exciting and make college tennis more relevant. And in this quickly changing landscape, the Committee also agreed to continue to monitor the pulse of the membership in looking ahead to the future. "Over the past several years the ITA Division I member coaches have engaged in a vigorous and dynamic dialogue about format and best ways to grow and promote the sport of college tennis," said David Benjamin, ITA Executive Director. "We are very proud of the way in which all of our coaches of men's and women's tennis programs - from widely diverse institutions - have managed to work together and present a unified front on such a complicated and critical issue." "We are supportive of the format recommendation made by the ITA Division I Operating Committee," said Virgil Christian Jr., USTA Senior Director, Market/Facility Development & Collegiate Tennis. "The collegiate coaches have navigated through a thorough and comprehensive process to reach this point. This is a critical first step in continuing to increase the relevance of college tennis on campuses across the country." The NCAA Division I Tennis Committee will teleconference on Tuesday, January 6th to review the ITA shortened format proposal for possible implementation in the 2015 NCAA Team Championship. If endorsed by the Tennis Committee, it will be put forward to the NCAA Division I Championships/Sports Management Cabinet for its approval. ITA Operating Committee co-Chair Sheila McInerney knows college tennis is on a long-term plan to become more fan-friendly and exciting. "Coming out of the ITA Convention, the men's and women's Operating Committees are excited to play the new scoring format," McInerney said. "We feel this shorter and more exciting format will benefit college tennis and are hopeful the NCAA Tennis Committee will endorse this format for the upcoming 2015 NCAA Team Championship." Boise State head men's tennis coach Greg Patton is filled with hope for the future of college tennis. "I think it's a dynamic step in the future that is going to dramatically and positively impact the growth of tennis in this country," Patton said. "Tennis could be in the top five [of college sports] if we do it right and we're trying to take steps to do it. We can't keep on being satisfied with the product that we're giving. We want to make sure it's exciting and timely. If we can keep it into a certain time frame, it's going to be really incredibly compelling and incredibly attractive to people. It's hopefully going to attract a lot of kids to the sport."